Life is always better with your best friend. Especially if your best friend happens to be covered in fur and walks on all fours. Nowadays, most places cater to your pup’s every whim, and there’s no shortage of such places in Redlands, California. From parks designated just for dogs to restaurants and boutiques, there’s something for those who love traveling with their pooch in tow. The Redlands Dog Park is located at 955 Parkford Drive, next to Ford Park. it’s open every day from 7 a.m. to 9 p.m. This off-the-leash dog park has a section for both small and large dogs. They even offer complimentary clean-up bags to keep the field clean. It’s the perfect spot for a social Spot. The park can get a tad overcrowded at peak times, but it’s still an enjoyable experience for dogs who like the temporary taste of gated freedom. Though not specifically a dog park, Sylvan Park is a great place for dogs to get in a lot of exercise. They need to be on a leash, but there are many places for them to explore with their humans in tow. The park is located at 601 N University St. in Redlands and is open every day from 5 a.m. to 9 p.m.
With over 23 acres of land, many hiking trails, and plenty of trees, Sylvan Park provides a dog with something new every visit. Anyone traveling through Redlands with their fur baby that enjoys the outdoors should definitely add Sylvan Park to their must-see itinerary. To give your furry friend the most time possible at the park, book a hotel nearby that can accommodate fur babies as well. That way, you can wake up early and get your pup the exercise they need to start the day. 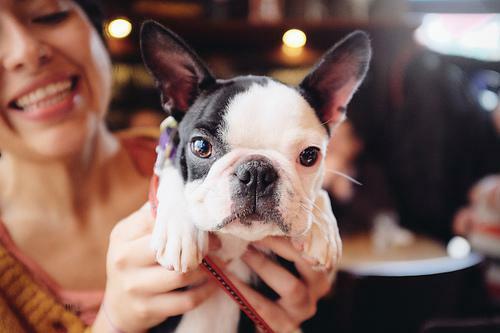 Aside from parks, there are a decent number of restaurants that gladly accommodate guests with their pups. One such restaurant is called Eureka! Yes, the exclamation point is part of the name. They are located at 345 W. Pearl Ave. and are open every single day from 11 a.m. to 11 p.m. They have a designated section in outside seating for dogs, and their menu consists of Americana style food. Plus, Eureka! has a large selection of craft beers and small-batch spirits. Every best friend deserves a spa day, and Fido is no exception. Enter Furry Face, a self-proclaimed full-service “spaw” that caters to both dogs and cats. Not only do they pamper pets, but they can offer health and diet advice for any animal that needs special attention or has dietary restrictions. They truly are in the business of taking care of your best friend. Finding places that accommodate man’s (or woman’s) best friend can be the determining factor for most people wanting a day out with their four-legged children. Whether it’s a day at the park or finding a place to unwind, a dog and their owner love to have options.